After a grueling 24 hours of traveling, and about 12 hours of sleep later, Jason and I found ourselves out in the “fresh” morning air of Bangkok ready to explore. 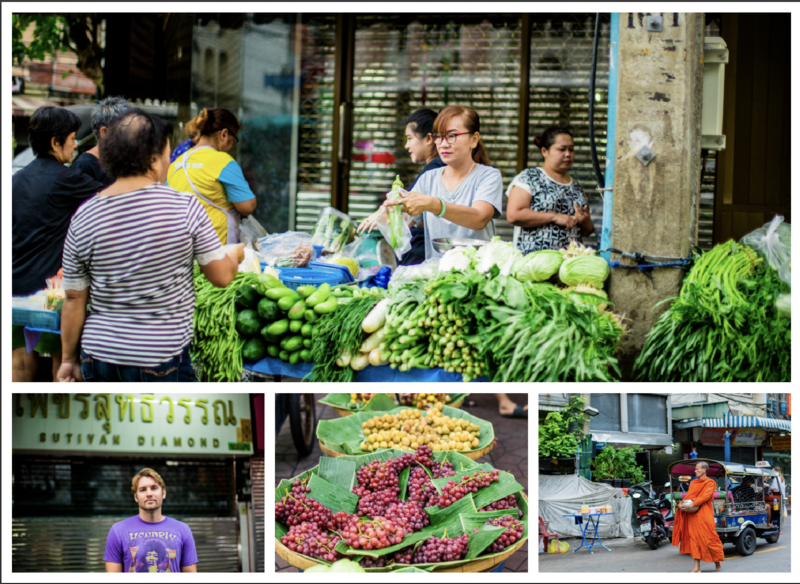 Morning markets are full of vendors selling fresh produce for the day. The streets were filled with stalls of fresh produce, and food vendors offering up anything from freshly fried donuts and bananas, satays, broths, and little mystery bags full of who knows what. Jason and I grabbed a couple of morning snacks, and cruised the different stalls. 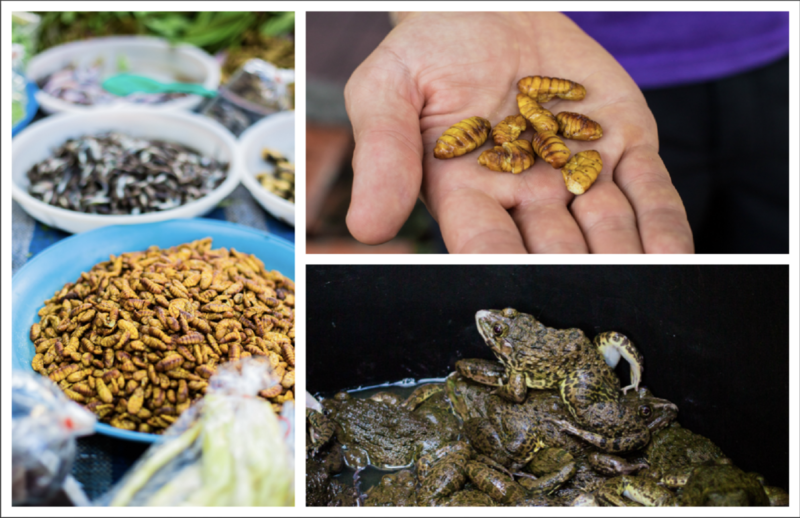 We also came across stalls with not so familiar foods, like live frogs, and some delicious grilled silk worms. Jason, being the brave man that he is, decided to also try a few of those for his breakfast. 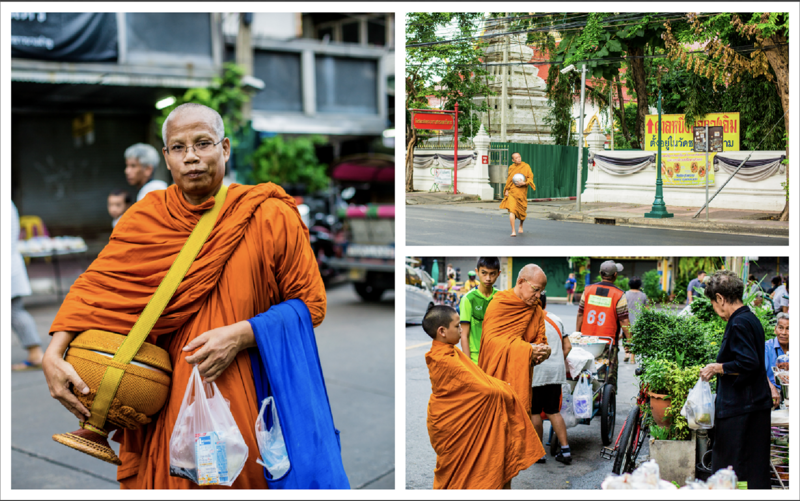 It was impossible not to notice the streets were full of Buddhist Monks, draped in their classic orange robes, receiving alms. The monks peruse the street vendors in the early morning, and fill up a pot they carry with food. What they are given is all that they will have to eat for the day. This act of lining up to offer alms every morning demonstrates just how devout and caring the Thai people really are. Every monk I saw walked back to the temple with a full bowl, and some fresh vegetables or flowers tucked under their arms. Our next venture of the morning was to walk to the Grand Palace, which was only a couple of kilometers away. We didn’t get too far before we were stopped by a morning jogger. Now, I had been warned not to be fooled by anyone trying to tell you that a particular attraction is closed for a holiday, but literally all of the streets were jam packed with police and people dressed in black, queued up, making their way slowly to the Grand Palace. This “friendly” stranger then asked us if we had a map. We pulled it out and he started marking down all of the attractions that were open. He even told us the times that they were open and made a little schedule for us as to what order we should view them in. He added that because it was a holiday, we could ride in a government taxi for only 20 baht each for the whole day, to take us to all of the monuments, it was a government promotion!!!! Now, I am a bit skeptical, number one, bc this jogger just happened to be carrying around a pen with him, who does that? And I am keen to believe that if a deal sounds too good to be true, it probably is. After about 10 minutes of him trying to engage us, we are able to rip ourselves apart and continue to try to make our way to the palace. But wouldn’t you know, not even 5 minutes later another man approaches us in the same matter? Then this guy asks for our map… which we have out already because we are trying to figure out how to get around the masses of people. He then snatches it from my hand and starts pointing to all the same monuments to go to, same prices, and the same whole damn spiel. “PM? Not… A.M.?” Really trying to stress that he might have his am – pm switched. Then the officer just looks at us very confused and we give up. We decide, OK, the Grand Palace is probably closed. Let’s try just walking to some of these other mentioned monuments. They sound pretty cool as well. We give up, and make our way back to our hotel to regroup. We go straight to the concierge and ask her if the Grand Palace is closed today, to which she looks at us, completely perplexed and assures us that, no, the Palace is open today, but not until 8am. I guess we can try again tomorrow. Sidenote: Apparently the streets are filled with people dressed in black because their King who passed away in October of 2016, is soon to be cremated, over a year later. Many Thais come daily to pay their last respects. 0 Comments on "Bangkok / First Impressions"